I’m strangely obsessed with using body scrubs, I make sure not to over exfoliate, but I’m super intense about having a strict schedule. 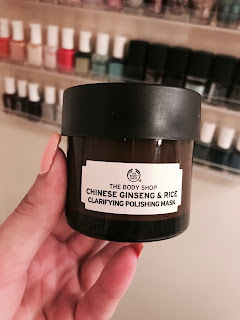 I love finding new body scrubs, especially from my favorite brands, one of which is The Body Shop. I came across the Satsuma Body Polish and was instantly drawn to the orange-citrus scent. Perfect for waking up when taking an AM shower. The polish is partly made up of ground walnut shells, which I found intriguing. I love the idea of an orange/ Satsuma scrub because then I know my skin is getting a healthy dose of vitamin C, which will protect it. This product also contains honey, which will allow skin to remain moisturized. I love that you can use the Satsuma Body Polish daily, it’s a softer exfoliant, non-irritating, and gives a great lather. Most polishes and/or scrubs aren’t going to give a lather, but I was surprised when I first used it and this one did! I typically use a light scrub like this every day on my shoulders, I’m not sure why I do this, but I do- it’s refreshing and makes me feel super clean! If you’re my friend you know I don’t really love anything coconut. I’m super picky. So, the question I’m asking myself is…why do I currently have three coconut products in my bathroom/ shower? & why am I so obsessed with them????? I’m obsessing over The Body Shop’s Coconut Shower Cream, Beautifying Oil, & Body Butter. The smell is incredible. First, the Coconut Shower Cream. Oh. mah. gawd. This is my new favorite product. It’s soap free and super moisturizing. I use it when I shave, and it’s perfect. It has a thick consistency which has been great throughout winter, and you don’t need a lot of the product to feel nice and clean. 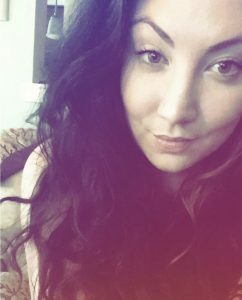 Despite it being on the thicker, creamier, side I’ve been using it since the weather has changed and it’s still been great. I had never used a shower “cream” before, I’m loving it way more than gel, it’s so much more luxurious & rich feeling. My next coconut favorite is the Beautifying Oil. I’ll use this right after the shower, not all the time, mostly before a weekend night out. 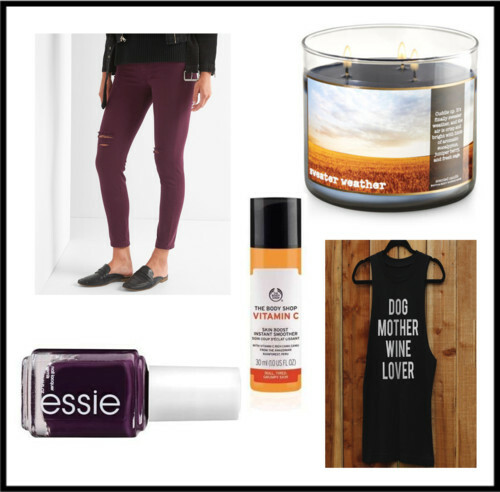 This oil is very hydrating and gives my legs a great sheen before putting on my night out look. I was skeptical about the size of the bottle in the beginning, it seemed so small and possibly not worth the cost. But of course, a little goes a long way and I still haven’t run out since getting this in January! 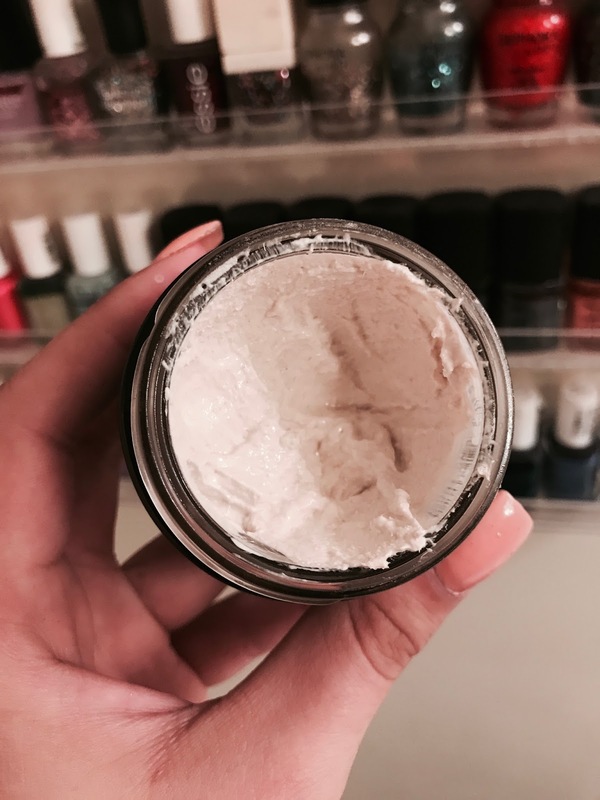 Lastly, the Coconut Body Butter is just….ugh, I am speechless…so amazing. This I ran out of rather quickly because in the colder month I seriously obsess with keeping my skin moisturized and ridiculously hydrated. I’ve been a fan of The Body Shop Body Butters for years, but this one actually has that “melt into your skin” feeling, similar to Lush moisturizing products. Head over to your closest Body Shop to test smell this fabulous collection, & since they always have great deals, you’re bound to find products you all of a sudden NEED! On Black Friday I did some shopping at The Body Shop because I always love getting their promotional bag with purchase and the entire store was 50% off. 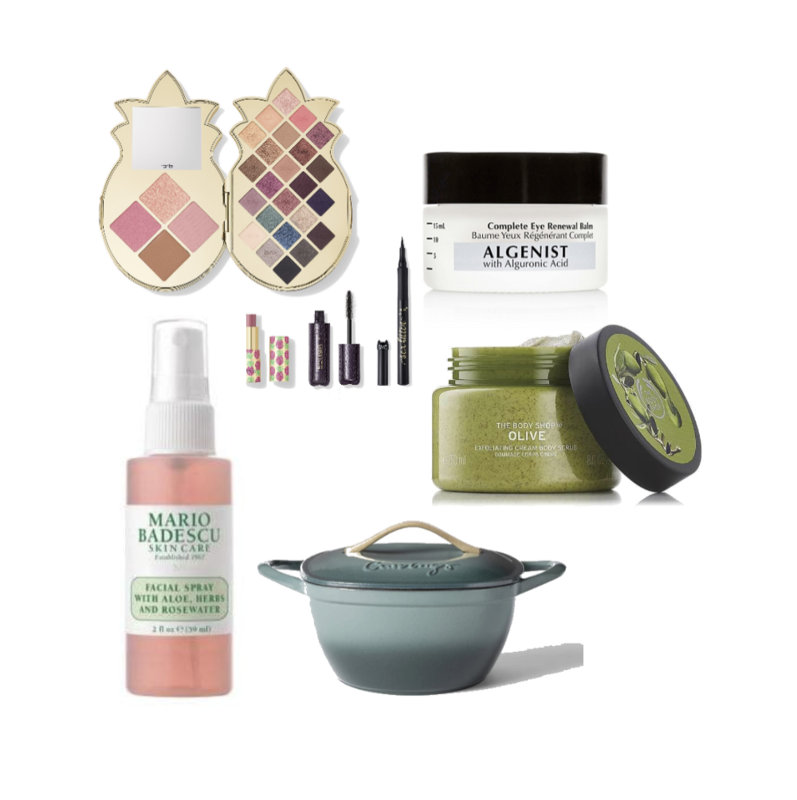 Since I have a lot of lotions, shower gels, and skincare products right now I opted to purchase only bath related products…best decision ever. 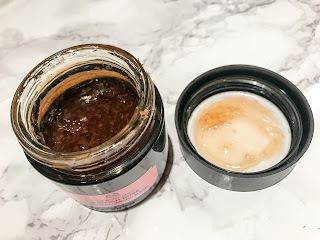 The first product I was dying to try was the Glazed Apple Bath Jelly. I’d never seen this before, and I was really intrigued by the name. This stuff is awesome. The smell is perfect for the holidays and the product itself is really interesting. The texture is totally like jelly and I just used a tablespoon to scoop it out under running water. My skin felt soft after using it too, sometimes I worry bath products can be drying. Luckily honey is a major ingredient in this so it’ll leave your skin feeling hydrated. The second product I purchased is the Spa Wisdom Polynesia Lotus & Frangipani Bathing Milk. I had no idea what this would really smell like but it smells nice and light, you really capture the lotus aroma. I didn’t get a lot of bubbles the first time I used it, unfortunately it looks like you need to use a ton of the product to get a normal amount of bubbles, which is annoying. It’s a luxurious product I wouldn’t have bought if it wasn’t for the Black Friday promotions so I’m glad I’m giving it a try! My last purchase was the Deep Sleep Comforting Milk Bath Float. My only regret with this product is not buying like 12 bottles to use throughout the year, because it’s a tad too much to spend to keep buying it regularly. Being exhausted after work is kind of my every day life, so soaking in this and just relaxing is incredible. The scent is soft and dreamy, and the camomile does its job of calming you and getting you ready for sleep. It’s not a bubble bath, just a soak, but that’s totally fine with me because I’m so addicted to this product it’s not even funny. 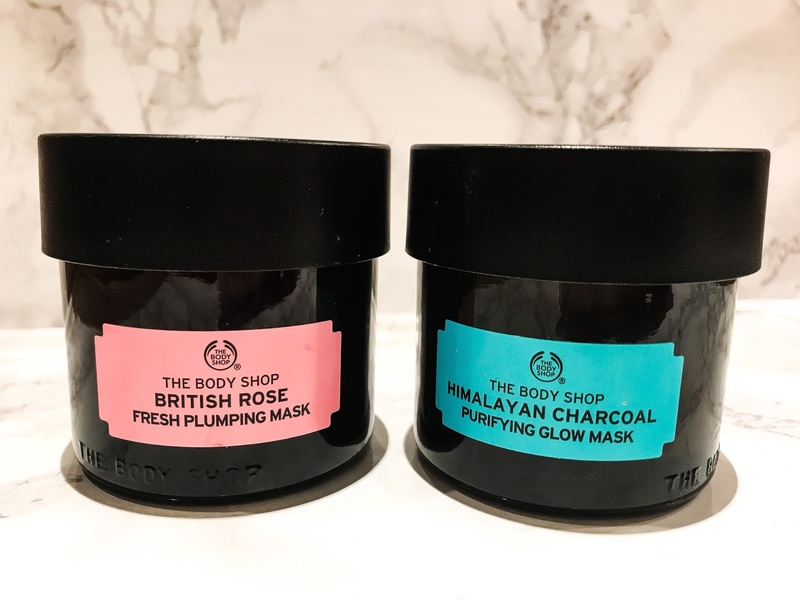 I cannot wait to make my way through these fabulous products so I can try everything else bath-related that The Body Shop has to offer!! If you know me, you know I’m obsessed with face masks. Seriously, obsessed. 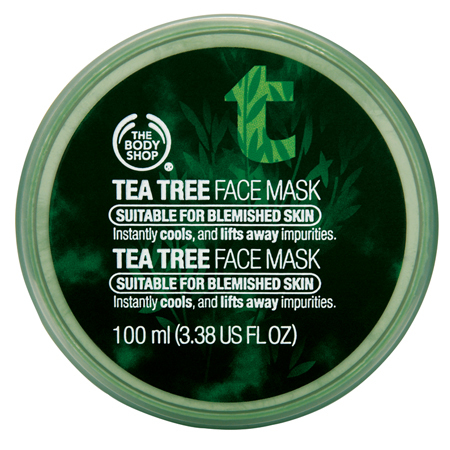 I’m a huge fan of The Body Shop face masks, especially the Tea Tree mask. It’s one of my absolute favorites and I can always rely on it to give my skin exactly what it needs to get back on track. The first time I applied this mask I applied it all over my face. BIG MISTAKE WITH ROSACEA, HUGE MISTAKE. It literally burned my cheeks and I was pretty sure I was going to die so I immediately took it off and stared in the mirror like a crazy person. I quickly learned, I can only use this mask everywhere else on my face besides my cheeks. If you have ridiculously sensitive skin I would stay far away from this product, or if you just have super sensitive areas make sure you don’t apply near those areas. Otherwise, it’s an amazing deep cleanser. I noticed my forehead and jawline area, where I can sometimes have hormonal acne, looked amazing after using the Blue Corn mask. It’s so incredibly refreshing, and felt amazing while it was on, and while I was taking it off. It felt like a mini-peel and I could see immediate results which I love. This mask is so interesting because with the power it has you would expect it to be somewhat hard and drying to the skin. 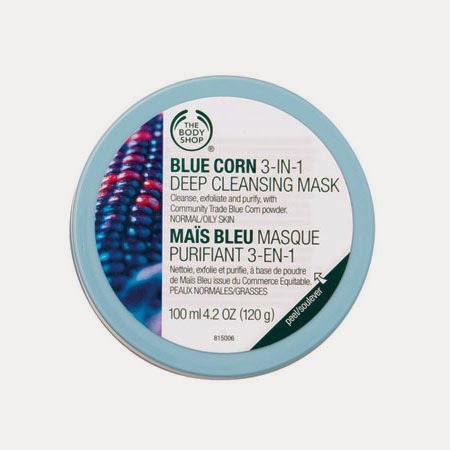 The Blue Corn Mask applies very creamy and will not leave you feeling tight and dry after you rinse it off, promise! The Body Shop always has special offers, and when you’re a Love Your Body Rewards Member it’s that much better, so next time you’re in the mood for a new face mask, I highly suggest this one!! Since I’ve been using this product for a few months now I figured it’s finally time to review it! I’m super loyal to Lush’s Ocean Salt [see post here] as my #1 exfoliator, but just for fun (and because I had an old GroupOn) I purchased The Body Shop’s Vitamin C Microdermabrasion. 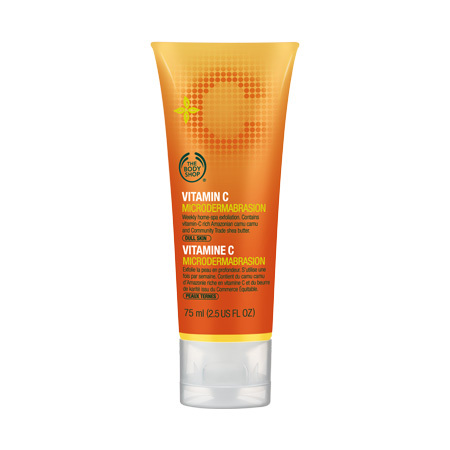 I’ve used some other Body Shop Vitamin C collection products before, and I was honestly intrigued by this one, so I gave it a try. It’s described as a facial but I wouldn’t necessarily call it that. It’s def very spa like in that the beads are so small and delicate so you’re really able to go deep in cleaning pores. A little goes a long way so don’t think because it doesn’t look super grainy that you’ll need more. You won’t! The two main ingredients in this product are shea and camu camu berry, which has extremely high concentrations of vitamin C…perfect for dull skin! The shea keeps the product creamy, preventing that rough/ dry feeling some exfoliants can produce. My skin definitely feels super soft after using it, however I also experience some redness, but that usually goes away by the time I’m finished with my routine after showering. You massage the product into your skin and then wash it off, don’t let it linger too long. 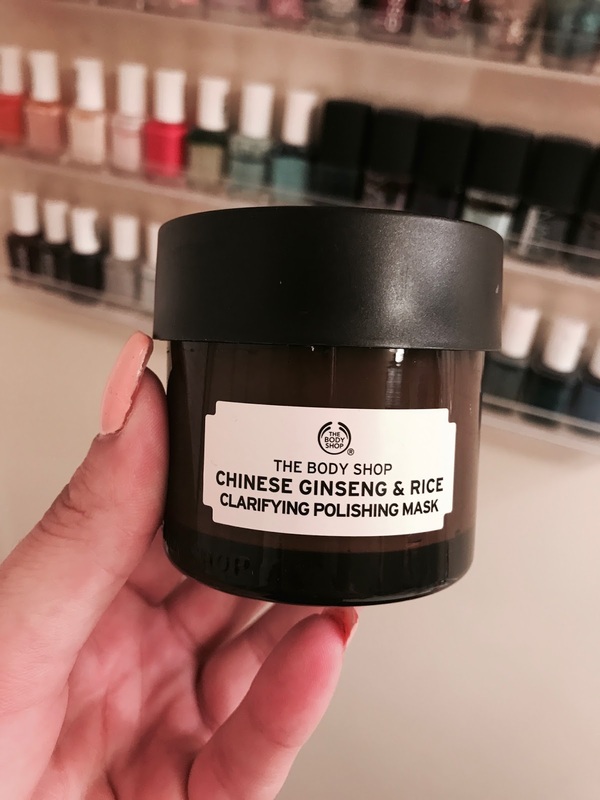 Also, The Body Shop does not suggest using this product more than once a week…it’d just be too rough on your skin. So, I use it on the day I use my hair/ face mask…which is always Friday! It took me a few times to notice a difference when using this product, but now that it’s been a few months, I can say I’ll definitely be repurchasing. I enjoy using it before my face mask so those mask ingredients can penetrate better after the exfoliate. I really love The Body Shop, I mean like I realllllyyyy love that store. All of their products are great, nothing ever disappoints me. One of the very first products I started using was their Tea Tree Face Mask, I think I’m on my third or fourth pot and you get SO many masks out of it! 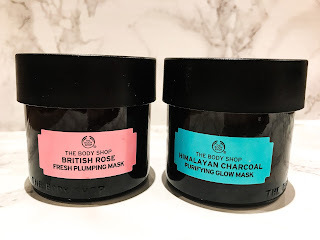 First thing I like about this mask, it’s super cooling and a tad tingly…I personally love that feeling, I guess it makes me think the product is actually doing something! 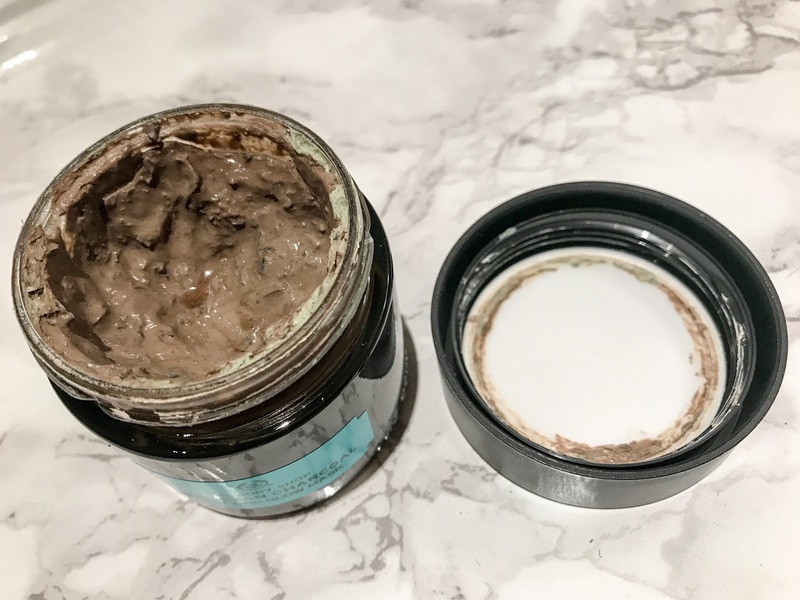 This mask is geared toward blemish prone skin, so it’s right up my ally– its goal is to remove impurities and combat excess oil & I think it succeeds at both. [You won’t feel dried out after using it, I promise!] I def see a difference in shine control right after using it, which is super important to me. I ideally try to use this mask once a week, but the reality is I don’t always get the chance. If you pick this up def try to keep on a schedule when using it, and it’ll be super effective! I noticed a change after two weeks. PS: I also use the Aloe Protective Restoring Mask [see review here] to combat redness and help keep me hydrated during the winter months. Just like this mask, it works!